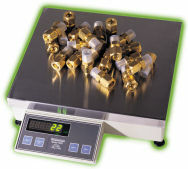 The MCT Series medium counting scales from LW Measurements provide superior counting performance in a compact package. 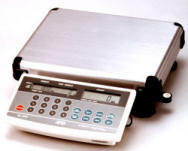 These easy to operate counting scales feature 21 bit A/D processors with 2 million internal resoultions. Most counting scales have internal resolutions of 600,000 or less, so the MCT will give your vastly superior counting resolution for the same capacities as other brands. The MCT is also ultra portable, the Medium size and rechargeable battery makes it perfect for taking around the warehouse during inventory. The simple keypad design makes setup simple and easy without all the extra keys that can confuse the operater. All this with extremely affordable prices! The Tree MCT Plus series of counting scales provides advanced functions and usability in a series of low cost counting scales. The MCT Plus adds a numeric keypad used for inputing known piece weights, setting sample sizes and upper/lower limits for check counting. The check counting function will notify the operator whether the counted pieces are high/low or correct with an alarm. The scales feature the highest quality sensors and 24 bit A/D processors with 1.3 million internal resolutions for maximum counting accuracy. The MCT Plus also features the Tree brands ANYCAL program that allows the unit to be calibrated using any known weight inputable via the keypad (2/3 capacity or higher recommended). All units feature internal rechargeable battery power or AC power operation. The CTS Series Counting Scales from MyWeigh feature all the benefits of modern digital counting scales with the legendary MyWeigh lifetime warranty. These precision counting scales feature rechargeable batteries, large stainless steel platter, standard RS232 interface and cable and AC adapter. Large green adjustable backlit display. The LCT series counting scales incorporate super solid design and performance for unparalleled performance and durability. These counting scales are designed for industrial counting environments where reliability and heavy duty construction are needed. The large 13.5 x 10 inch heavy gauge stainless steel platter will not warp over time or bend under large loads and is supported by a large four post die cast aluminum sub-platter for rigidity. The LCT incorporates name brand load cells for consistent quality and resolution coupled with a super fast analog to digital processor with 1.3 million internal resolutions and a 1 second response time. The large LCD display and convenient keypad feature a 9 key memory recall for commonly counted parts. The LCT also features patented open calibration software that allows you to calibrate with any known weight. The LCT clearly delivers professional quality and performance at an economical and affordable price. 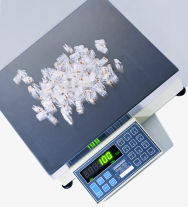 The CKG series of scales provides an accurate, fast and versatile series of counting and check-weighing scales. All models have stainless steel weighing platforms on an ABS base assembly. All units include automatic zero tracking, audible alarm for pre-set weights, automatic tare, pre-set tare and an accumulation facility that allows the count to be stored and recalled as an accumulated total. High resolution counting scale. Battery and AC operational. Memory for 100 item unit weights w. preset tares. Blue backlit LCD display. Soft touch keyboard. Ideal for use in warehouses, manufacturing processes, and production facilities, the Adam Equipment CCT Cruiser series bench counting scale is practical for any counting application. Quickly check the number of pieces in a carton or container, helping reduce waste when filling orders or packaging shipments. Intuitive software is user-friendly and keeps track of the count, automatically optimizing the unit weight for greater accuracy. The programmable backlit display can be can be customized to be "always on," "always off" or to light only when weighing. Buy your next Adam CCT counting scale at Hogentogler for a great discount price! The built-in rechargeable battery pack with up to 200 hours of continuous use not only monitors the battery life, but also recharges the battery while the scale is in operation insuring no unexpected "down time". Preset count and weight limits can be set to alert the operator that a quantity or desired weight has been achieved. The is an excellent feature for packaging of parts and products. Simple and easy operation with high performance counting function! With the HC-i series, you can easily build an inexpensive inventory control system. The HC-i series is cost effective and will improve reliability by eliminating errors and unnecessary repetition during large volume counting jobs. Precision counting scale. Easy to read VFD displays. Large memory supports 1000 item unit weights. Metric / Pound units convertible. High speed, accurate counting scales, 10 lb, 20 lb, 50 lb, 100 lb, lb/g key, Vacuum Fluorescent Displays. 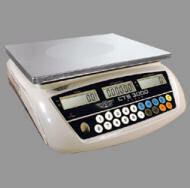 The GBC is a fully featured counting scale with numeric keypad for unit weight and sample entry. The bright large backlit display shows unit weight, total weight and number of pieces. 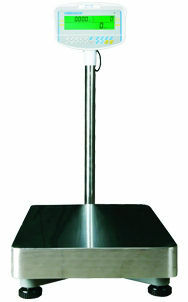 A grade 304 stainless steel top pan with mild steel base and pillar mounted ABS plastic indicator, make the GBC a durable industrial floor counting scale. One, two, three, four...still counting parts by hand? Why? Eliminate this mind-numbing task, greatly reduce material handling time and increase accuracy with the Omega Counting Scale. Designed for warehousing and light manufacturing applications, this scale will deliver reliable, easy and fast counting functions sure to increase efficiency and reduce overhead. The Omega’s ability to store hundreds of parts in memory (PLU) further reduces time spent counting. Parts warehouses and production companies will find the Omega an invaluable tool for accurately maintaining inventories of small or large components. 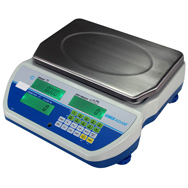 The GFC is a fully featured counting scale with full keypad for unit weight and sample entry. The bright large backlit display shows unit weight, total weight and number of pieces. A solid stainless steel platform and pillar mounted ABS plastic indicator, round out the GFC to be a complete floor counting solution. The GFC also offers check counting to a predefined weight or count. The RS-232 interface makes recording the results effortless with connections to printers and computers. Fast, accurate and dependable. Designed for speed and exceptional accuracy, the 7500 series is the heart of any inventory control requirement. No other counting scale provides more impressive performance and vlaue with the simplicity and rugged durability of the 7500. 4 Year Limited Warranties - the best in the business! The Tree DCT Dual Counting Scales offer more precision and capacity than most counting scales in a 1,2 or 3 platform setup. 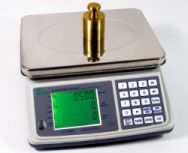 The small weighing pan allows for greater precision when computing sample weights while the larger platform accomodates larger and heavier loads while still using the sample weight from the smaller, more precise, platform. Additionally, a third base can be connected to the DCT via the RS-232 or USB interfaces for even more capacity/larger loads. The DCT also has a full numeric keypad for entering known piece weights, sample size input or hi/low limit entry for check counting. All Tree DCT scales feature an internal Rechargeable battery or AC power operation, Stainless steel pans and a large bright LED display. These counting scales also feature Tree's ANYCAL calibration software which allows calibration of the unit with any known weight (2/3 minimum capacity recommended). The DCT series have 24 bit A/D processors with 1.3 million internal resolution elements and 30,000 displayed divisions. Fast, accurate and powerful. From simple one-button counting to sophisticated inventory control systems, the 7600 has a long list of features designed to adapt to your changing needs. Single or dual base counting. Percent of Error or Accuracy. Sample Update (TM). Powerful RS-232. Rugged cast construction. Clean, efficient design means impressive accuracy and stable counting and weighing in a wide range of requirements. Universal Flex Com (UFC) Setup Software allows user to format printer output data.